This incident of a hiker that went missing in Joshua Tree in 2010 and has yet to be found was discussed in this forum before, so there might be some interest in this. Interesting. And good work on the Death Valley incident. I'm a visual kinda guy. If a picture's worth a thousand words, one map is worth at least a Megabyte of prosey track descriptions, at least to me. My shortcomings aside, that really is an impressive compilation of data. Bill parks at the Juniper Flats TH. Presumably he heads towards Juniper Flats and then Quail Mtn. The 10.6 mile radius from the cell phone tower is the opposite direction from his vehicle. The topographical relief out there is pretty good -- quite distinctive. It's hard to imagine that he got turned around and headed in the wrong direction for his vehicle, although I suppose it could happen. Why would he head away from his vehicle? Weird. It appears most of the searches were in the vicinity of Quail Mountain and the areas north and west. But let's say he ran low on water and decided to head to Stubbie Spring. For there he could have headed toward the Fan Canyon overlook intending to get toward Key's View. He could have started down toward the lights of the desert. When people get into to trouble, they often go down, just like that guy who got lost near Eureka Peak and hiked almost all the way to DHS. Looking down from the Little San Bernardinos, the Coachella Valley doesn't seem that far. I'm wondering how many searches were done to the south? halhiker wrote: It appears most of the searches were in the vicinity of Quail Mountain and the areas north and west. But let's say he ran low on water and decided to head to Stubbie Spring. For there he could have headed toward the Fan Canyon overlook intending to get toward Key's View. He could have started down toward the lights of the desert. When people get into to trouble, they often go down, just like that guy who got lost near Eureka Peak and hiked almost all the way to DHS. Looking down from the Little San Bernardinos, the Coachella Valley doesn't seem that far. I'm wondering how many searches were done to the south? There was considerable searching around Stubbe Spring, and with dogs, due to a stench of death. Turned out it was a Big Horn carcass. The tracks are shown on the overall map. The problem with Stubbe Spring/Fan Canyon/Keys View area is that it's impossible to ping the Serin Drive cell tower from anywhere near there. OTOH, you can light up multiple cell sites across the Coachella Valley, so if there was a problem, he could have made a phone call. If he had started a downhill run down the drainages (like Ed Rosenthal did a few months later out of Black Rock), he would have ended up in the main drainage to Desert Hot Springs. That route does get occasional foot traffic and he should have been found by now. And of course you can't ping the Serin tower from down there. So it's a mystery. halhiker wrote: It appears most of the searches were in the vicinity of Quail Mountain and the areas north and west. Which is where the cell phone ping was detected. I guess you have to decide how much credence to give that danged ping. We know he was parked at the Juniper Flats Trailhead. We know he was interested in Quail Mtn based on his itinerary. We've got a cell phone ping to the NW of where he parked his van. He's described as a strong hiker and accustomed to the Georgia heat. He's been to J Tree multiple times. 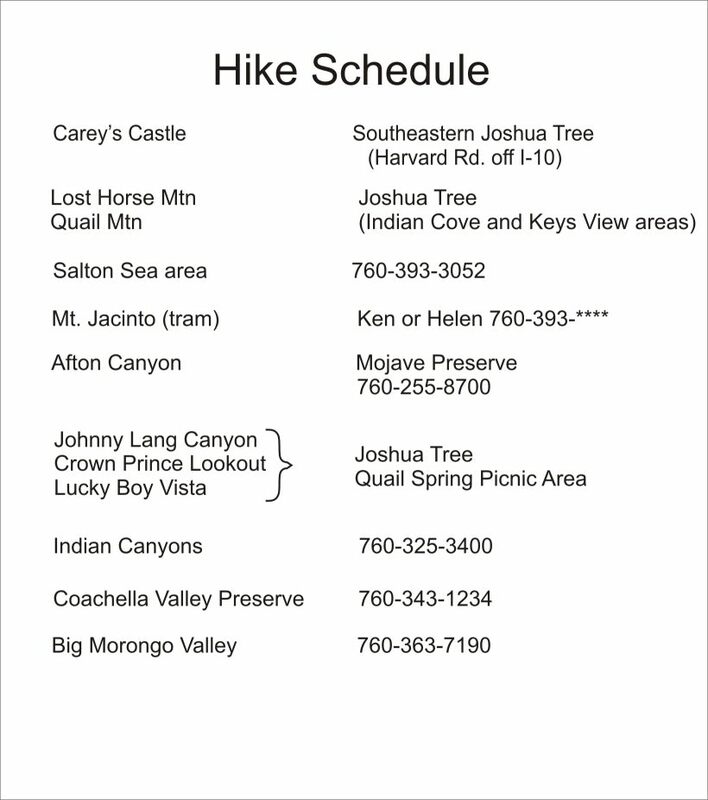 If he's a strong hiker, been to J Tree multiple times, and lists something like Quail Mountain (which requires XC travel) on his itinerary, then perhaps he is capable of some fairly serious hiking. I took a minute and plotted the four HPS routes to Quail on a map. His vehicle was found at "A." Route one is points A - B - C - D, with "D" being the summit. Route two is E through K and then joins route 1. Route three is L through O, with "D" being the summit. You'll have to scroll to the left to see "L". Route four is P through S and then joins route 1. It's possible that he might have gone to Quail's summit via route 1 and then tried returning via another route. Either route 2 or route 3 would put him closer to the 10.6 mile cell phone ping radius. Perhaps he ran out of time/daylight on, say, route 2 and decided to go down stream, NW, in Johny Lang Canyon. I can see in satellite view that there's still something left of the road which would be followable in the dark. I've made similar choices on hikes where I was running late. If he went NW, that puts him closer to the 10.6 mile cell phone ping radius, although still not quite there unless for some reason he turned left on Quail Springs Road and went west. Really hard to figure how a guy approaching Quail Mtn from the SE winds up sending out a ping from west of the mtn. Take a look at this map. Take a look at where I've positioned point "A". Now, notice something. The lines don't quite line up. This is the meeting point of four printed 1:24,000 topo quadrangles. OK, so you're Bill Ewasko. You're headed out on route one (see the map link in my post, above) from the Juniper Flats trail head. What topo map sheets do you bring? You bring the one for the trailhead and the one immediately to the north (with the peak on it) of course. But you don't bring the map sheets for points west. Why would you? Now, you're en route to Quail Mtn. You have an accident. You break your leg, ankle, whatever. You've got your two topo map sheets... and that little hand out map that they give you at the park entrance. You're injured and in trouble. You can't make it back to your vehicle. You see La Contenta Rd on the NPS map. You head for the road. I'm just trying to place Bill Ewasko within that 10.6 mile cell ping radius. It's plausible that the edge of the map sheets could have played a role in Bill's decision making. My hunch is after the ping he could have headed toward the spring, out of water. From there, continue on the trail and then down. It's possible that his battery died on his phone by the time he got view of the Coachella Valley. It's just a hunch. I know that terrain pretty well--although I haven't been anywhere near 34 times-- and I've seen two bighorn carcasses near Stubbe Spring. One near the spring and one in the drainage that leads to Fan Canyon. If he went that way, there are some steep dry falls that would not be easy to down climb. Also, any of the other drainages down to the Coachella Valley out to 1000 Palms and I'd imagine almost never get foot traffic. If you were going to get lost and not found, that would be the place. Possibly although I don't see why he would head to the north and west and then go to Stubbe Spring. Dunno. He appears to have done something very odd, so maybe you're right. Here's a flyer on Bill Ewasko with his photo. Always helps me to humanize things. 5'10" 165#. Looks fairly fit. My dad could hike a lot of 20 year olds into the ground when he was 65.